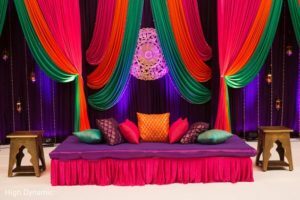 Indian weddings are well known for its eye treating colors and different ceremonies. 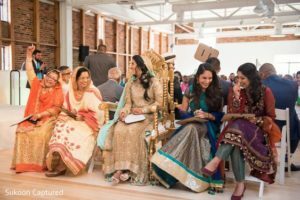 An Indian wedding is incomplete without a game, right! Yes, games are the best way to break the ice of two new families which can bring a better understanding between families. 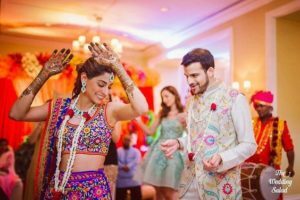 In this article, We have listed some of the best funfilled Indian wedding games for the bride, the groom and as well as for the guests which you can play on your sangeet or wedding ceremonies. We have collected some hand full games for sangeet ceremony, come let’s see them one by one. 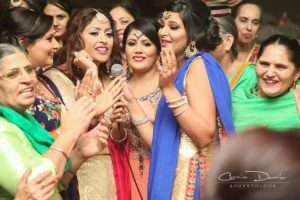 This is the best game for sangeet evening where it is all about song and dance. Play the music and let everyone to dance for the song. In the midway pause the music, as the music is paused everyone needs to freeze in the exact position. The person who stands for the longest time in the same position is the winner of the game. This will definitely bring out funny memories at your wedding photography. This is a simple wedding game but will be interesting and funfilled. The game needs a group of people and a DJ. The game starts with music ON and passing the cushion to the other person. On the midway, the music is paused and the person who is holding the cushion has to perform a task given by the group like singing songs, dancing or any funny activity. Then the game goes on with the music. Make sure you have a crazy people in the group to make the game interesting! Some games can be romantic too! 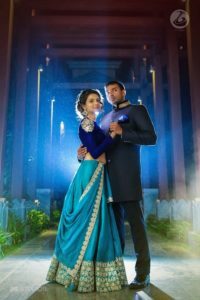 This game is for all the young couples to make the sangeet evening more special. The bride and the groom dance on a paper, which is folded into half the size after each song. So, the smaller the paper becomes, the closer you get! One of the best fulfilling game of all time, Antakshari is one of the best games to make the sangeet night more special. How fun would it be watching guests singing songs after some shots of cocktails down! This game best suits for mehendi or sangeet ceremonies. The game is about the groom finding his name in the bride’s mehendi, which will be very difficult to spot out though! As all the girls including the bride apply mehendi, the game will make your sangeet ceremony more special. Weddings are incomplete without dances so, why don’t we have a game with dance. 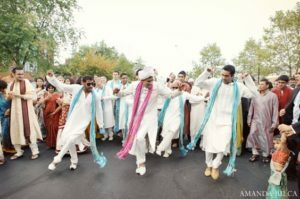 Make two groups, generally, the bride family and the groom family has two groups and dance for the songs played. The group which dances for a long time without drop of energy would win the game. Boys are always less aware of their partner. So, we have some interesting games to find out how well the groom has understood his lady love. Here, come the game list. This game is for all the husbands including the groom. Ask the wives to hand over some of their belongings, like earrings, clutch, watch, shoes. Place them on a table all together. Then comes the husbands, they have to go to the table and find out their wives items and handover to her. If he finds out right, then he will be gifted with an exciting prize. 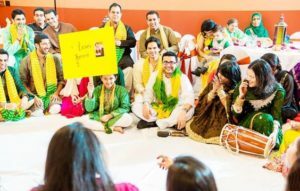 This Indian wedding game is specially for the groom! Take a long saree and cut small holes in a horizontal line. Now make the ladies stand behind the saree and put their hands inside the holes. The groom has to guess which hands belong to his love lady. If he guesses it right then he is awarded the prize but if he goes wrong then he has to some funny tasks given to him. Now, it’s for the brides. The bride is always tested by the groom’s family in all aspects. These games will also test the ability of the bride in handling situations in a good and funny way. Generally, this game is played in Gujarati wedding, where the brides have to accept the gifts showered by new family members. Here, comes the task, she must try to hold all the gifts and walk around with the gift without letting it fall down. 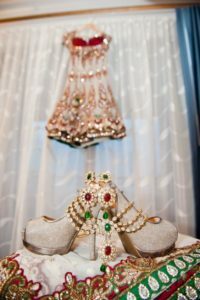 This will symbolizes that the bride is resourceful and ingenious. We all love eating, but finding the ingredients in the food is little difficult! Close the eyes of the bride and feed her an exquisite dish from the buffet and ask her to write down the ingredients used in the dish within one minute. This will also reveal her cooking skills to the new family members. so, be careful if you are a bride! 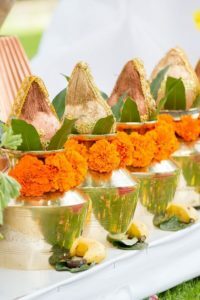 Indian wedding games are a combination of rituals and fun. Here, we have collected some funny as well as traditional wedding games which you should try out at your wedding. 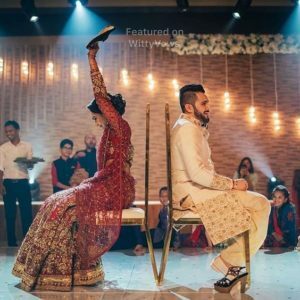 This Indian wedding game is quite famous in the west, but now it has been played in all parts of India. This game will definitely be very interesting has the couple answers some silly yet suspicious questions simultaneously. For say, The question can be who has more siblings. If the groom has more siblings, then both the bride and the groom should raise the groom’s shoe! Ring toss, we all would have played this game in our childhood at street side and beaches. 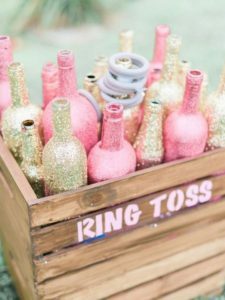 Now, try this game at your wedding by just stealing small things in and around like drinks, snacks, toys (for kids), accessories, and even some money if possible. Ask your guests to throw the ring on the goodies and simply own it! 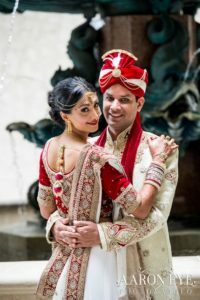 Indian wedding is more of custom tradition and rituals. Even this game is a traditional Indian game where a ring is dropped in a bowl, both the bride and the groom need to find the ring. Whoever finds it first is deemed to be dominant over the partner in life. A wedding is not only about two hearts getting tied together but it also about two new families getting close together. So, the bride and the groom will not be aware of each other family very well. This game will help them to sort out the family members in a funny way! This is one of the traditional Indian wedding games which is performed after the couple tied the knot. The bride and the groom sit opposite to each other with a 10 feet distance. The couple rolls the coconut to their partners and aims to break the coconut in the midway. The couple is given three chances to break the coconut as it shows a positive sign of leading a happy life. This is an age-old game which we all would have played in our childhood. This game is solely between the cousins keeping the bride and the groom in the opposite side. Throw in a rope in the middle and the cousins from both the sides have to tug the rope in opposite directions to grab the prize. Games are not only for the couples, but we also have games for the guests because treating and making the guest happy is more important. Have a look at the interesting wedding games for guests below. Who says no to hula hoops! especially children. 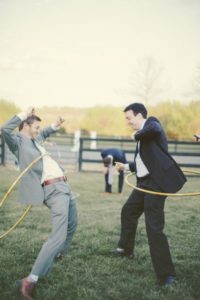 If your wedding is in an open lawn then you can add hula hoop into your wedding game list. Not only kids, but even adults would also enjoy playing this game. When all the games are of rituals and fun filling, this will be something interesting and most liked game for all of us. Both the bride and the groom’s family get into this game. 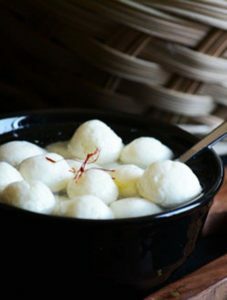 Two families are set up to eat the maximum number of rasogullas while the other family members cheer up the players and the winning side would get major bragging too. This is a simple game for us but not for the players. The players of the game are the bride and her new family members. Generally, the bride will not be aware of all the things about the groom’s family. This game helps them to open up and share things. The game starts by asking 20 questions to the bride that help her open up her thoughts and similarly she questions the groom’s family. Make sure that it is rapid fire to make it more engaging and amusing. 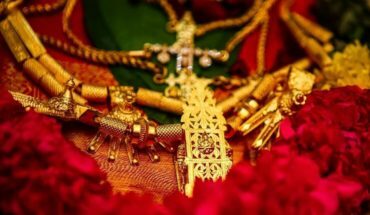 Generally, South Indian wedding takes place with a reception the previous day before the wedding. So, dumb charades would be the right game to play at your reception night. This game can be played by both children and adults. If you are a very good mono actor then get into the game and have fun! Hope you all enjoyed reading this article. 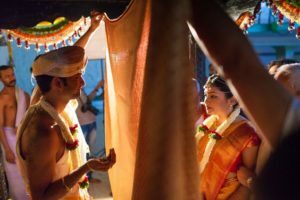 Try out this interesting Indian wedding games on your list and make your wedding diaries more memorable. If you feel any game is missing, then feel free to comment below.